It was a rimy morning, and very damp. I had seen the damp lying on the outside of my little window, as if some goblin had been crying there all night, and using the window for a pocket-handkerchief. Now, I saw the damp lying on the bare hedges and spare grass, like a coarser sort of spiders’ webs; hanging itself from twig to twig and blade to blade. On every rail and gate, wet lay clammy; and the marsh-mist was so thick, that the wooden finger on the post directing people to our village – a direction which they never accepted, for they never came there – was invisible to me until I was quite close under it. The mist was heavier yet when I got out upon the marshes, so that instead of my running at everything, everything seemed to run at me. This was very disagreeable to a guilty mind. 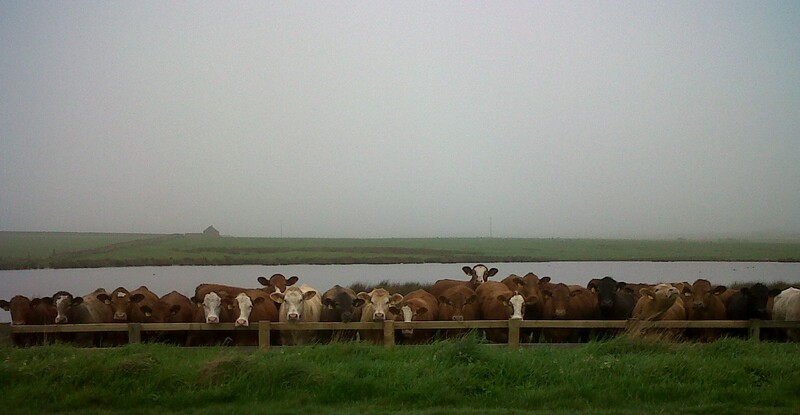 The gates and dykes and banks came bursting at me through the mist . . . The cattle came upon me with like suddenness, staring out of their eyes, and steaming out of their nostrils, “Holloa, young thief!” One black ox, with a white cravat on – who even had to my awakened conscience something of a clerical air – fixed me so obstinately with his eyes, and moved his blunt head round in such an accusatory manner . . . Yet I – as we say round here in a particular tone of voice – have done nothing wrong! Nevertheless, the concentrated stare the cattle gave us challenged Newman’s inordinate consumption of seaweed (which had made him boke over the weekend) and Barnaby’s crafty downing of slate (which does nothing for his digestion). Over the past few days our part of the coast has been coated in this swirling and persistent mist, which has come and gone only in intensity, sometimes moving with exceptional speed and at others creeping slowly up on you, like a phantom out a-haunting. Yesterday afternoon the wind batted it across the mere, creating will-o’-the-wisps of the terns and ducks dangling on it. As I write, it has enveloped us again, not quite a London pea-souper as it’s entirely the wrong colour, but bringing that quiet resolution to the moment in which mystery thrives and dark deeds get done. All in all, we like what it does to our world: there’s a chill in the air but a gentleness too, as though the ordinary things have been wrapped in cotton wool, from which they peer, reminding us how special they are.